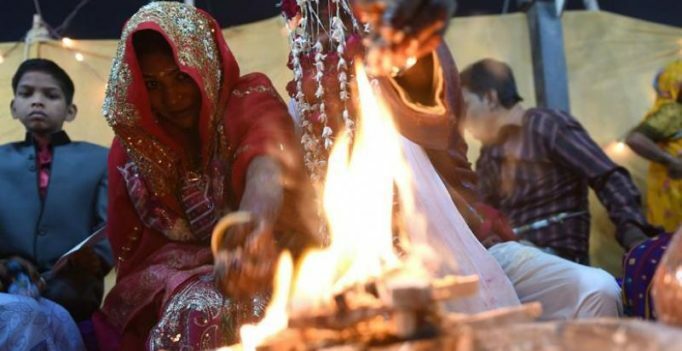 Islamabad: The much-awaited landmark bill to regulate marriages of minority Hindus in Pakistan is set to become a law with the Senate unanimously passing it. The Hindu Marriage Bill 2017, which is the first elaborate Hindu community’s personal law, was adopted by the Senate on Friday. Dawn News reported that the bill is widely acceptable to Hindus living in Pakistan because it relates to marriage, registration of marriage, separation and remarriage, with the minimum age of marriage set at 18 years for both boys and girls. The bill will help Hindu women get documentary proof of their marriage. Constitution was vast enough to cater to such needs. Ramesh Kumar Vankwani, a leading Hindu lawmaker from the ruling Pakistan Muslim League-Nawaz, had been working relentlessly for three years to have a Hindu marriage law in the country. “Such laws will help discourage forced conversions and streamline the Hindu community after the marriage of individuals,” he said, expressing gratitude to the parliamentarians. Vankwani also said it was difficult for married Hindu women to prove that they were married, which was one of the key tools for miscreants involved in forced conversion. The law paves the way for a document ‘Shadi Parath’, similar to the ‘Nikahnama’ for Muslims to be signed by a pundit and registered with the relevant government department.